During the past few months, a number of Members have been seen on Friday mornings behaving violently! They are participating in the Parkinsons Punching Challenge! No, this is not another weird symptom of our favourite disease. Rather, it is a well-regarded treatment for our symptoms - and no, there is no actual violence. Well, not against people anyway. Boxing For Parkinson's is an excellent way of exercising the eye - brain - hand coordination that is adversely affected by PD. 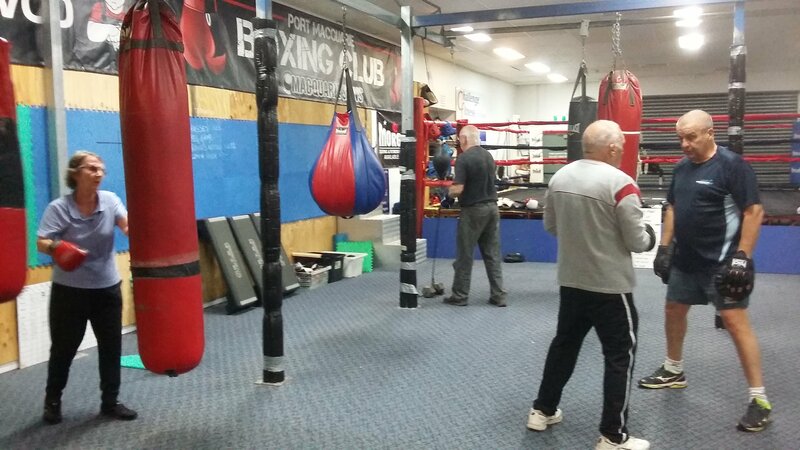 The program is being provided by a National boxing coach and referee, Dean Groth, and is located at Port Macquarie Boxing Club, at Challenge Fitness on Hastings River Drive. It is free (for an introductory period) and open to both women and men (yes, we realise we are creating a stick for our own backs teaching women to box). All you need is some light clothes (track pants or shorts and t-shirt) and a pair of sport shoes. All equipment is provided. Why don't you come along and join the fun, from 10.00 until 11.00 am every Friday - except the third Friday of the month when we start from 9.00 am (to finish in time for our monthly Group meeting) at Challenge Fitness (opposite Harvey Norman on Hastings River Drive).